CertainTeed, a leading manufacturer of roofing shingles, offers a large selection of roofing shingles that are said to be a step above the typical asphalt roofing shingles, offering a reliable choice for protecting and beautifying your home. With a dual-layered design, CertainTeed shingles offering the heaviest weight and the largest array of colors in its class, allowing homeowners to re-create their look with confidence. Backed by its 100+ manufacturing process, the company includes a lifetime-limited, industry-leading warranty. How much do CertainTeed roofing shingles cost? The cost of CertainTeed roofing shingles depend on a few factors, including the type of CertainTeed roofing shingle you want to purchase, the contractor you hire (if you plan on doing so) and the scope of the project. For most professionals, at least from the quotes we researched online, CertainTeed roofing shingles tend to range anywhere from $2 to $5 a square foot professionally installed or about $4,000 to $10,000 for the average 2,000 square foot home. As for the higher-quality CertainTeed roofing shingles, such as the designer and luxury brands, then the costs could be much more, often as high as $5 to $7 per square foot or about $10,000 to $14,000 for the average 2,000 square foot installed. These prices will not include the removal and disposal of the old shingles as this could add yet another $1 to $3 per square foot to the costs above. For just the materials, again, it will greatly depend on the type of CertainTeed roofing shingle you want to purchase. On Roofcalc.org, in its GAF Timberline vs CertainTeed article, for instance, the price per 100 square foot could range anywhere from $78 to $150, with the Landmark Pro being the costliest and Landmark being the cheapest option. Again, this was for the materials only and would not include the professional labor. Viirt.com, a professional roofer located in the Washington area, noted the average prices on his website, listing some of the most popular CertainTeed Landmark shingles and what it may cost. The CertainTeed Landmark, for instance, started at $281.40 per square or 2.81 per square foot installed, while the Landmark TL started at 438.98 per square or $4.38 per square foot installed. The Premium was in the same range as well. According to the FAQ of the website, these are just basic estimates and could increase based on the scope of the job. Landmark Fiberglass base mat, with a laminated shingle. This is the cheapest option and is considered the entry level product offered by the company. Landmark Pro Identical to the Landmark, it offers a thicker layer to create a heavier shingle. Landmark Premium Said to have a limited amount of colors when compared to the others, but it is heavier than the previous two at 300 pounds per square. Landmark IR Designed to withstand stronger elements such as high winds and hail as its built with a tougher iteration. Landmark TL Tough patented three layer laminate construction with a large array of colors to choose from. 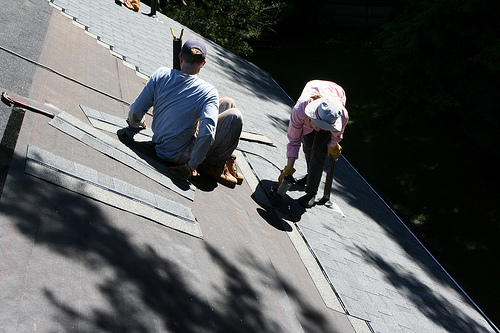 If you’re interested in the basic warranty, then you can have your shingles installed by a professional roofer of your choice; however, if you want a more comprehensive roofer, then the company requires that your installation is performed by one of their certified contractors. Also, if you do plan on receiving an upgraded warranty, it is the roofer’s responsibility to fill out the warranty information and submit it to the company. Failing to do so will mean the warranty will not exist for your home in the future. As for the warranty, the non-prorated coverage is full for the first 10 years of the SureStart period and is pro-rated 20 percent at 40 years and beyond. As for labor for shingle replacement, the first 10 years is included, while the wind uplift damage is 110 mph during the first 15 years. A wind warranty up to 130 mph is available for an additional cost. The StreakFighter® algae-resistance warranty lasts 10 to 15 years, depending on shingle choice. Lastly, the warranty can be transferred once during the first 10 years for full coverage; after, it only includes two-year cover from the date of the transfer. As with any warranty, there are limitations which can void the warranty such as poor roof deck ventilation, for example. For more information on the company’s warranty, you can refer to the official PDF. To find a local retailer and/or distributor that sells the shingles, you can do so via the company’s official “where to buy” search tool. The colors do vary based on the model you want to purchase and your geographical region, but you can view most of the colors on this brochure.